There’s no doubt that the bathroom is an important place to be, so it makes sense that homeowners take pride in their bathroom designs. We’re in there a lot, for a variety of reasons, so if we’re to feel comfortable there it makes sense for the room to be attractive and welcoming. Now, how do you know that you’re hiring the right contractor to give your bathroom the makeover of your dreams? 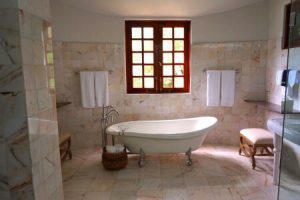 Here are a few things for you to keep in mind while you’re searching for the perfect bathroom renovator. Home Improvement Contractors are very popular right now. Consider companies in your locality. Contractors that have experience working with houses in your area are likely to be more familiar with the plumbing style of your region, as well as the age and structure of homes similar to yours. Of course, a good company should be able to handle anything, but it would be an added bonus if they had experience with homes that are built the same way as yours. So break out the old Yellow Pages, or Yelp, or Google, and search for businesses close to you. Take into account the size of your bathroom and look for a company that specializes in something similar. If your bathroom especially big and spacious, they will likely have an easier time than if they were working in a smaller space, due to not being able to fit as many people or as much equipment into the space. That said, the bigger the bathroom is, it’s likely that they will be doing more complicated projects. Remember your plumbing appliances and other potentially complicated architecture. Are you trying to install Jacuzzi jets in your bathtub or just repair a damaged toilet tank? Are you looking for a variety of water pressure settings, fans, lighting, and other frills, or simply trying to fix a leaky faucet? The scope of your project is important to keep in mind, especially if you are trying to turn a half-bath into a full luxury day spa. Of course, stick to the budget. We all need to keep clean – that’s a necessity. Just be sure to remember that while you might be getting excited at all the options available to you, not all of them are financially responsible choices. So make sure you plan well and don’t take on anything that seems like it would be too much. Ask about a time estimate. If you’re looking for something to be done in a short period of time, you’ll want to be honest about that issue up front. You’ll also need to make sure to be understanding if any unforeseen issues crop up that the delay the completion of the project. The search for a reliable bathroom contractor might seem overwhelming, but it really is just a matter of communication and planning. Most companies welcome general inquiries and offer free consultations, and those can be a huge help, giving you an idea of the company’s services and prices without the commitment of needing to hire them afterwards. Good luck with your journey, and be sure to share the amazing results! This entry was posted in Blogging, Construction, Home Improvement. I am passionate about Home Renovations. Here at my blog Home Renovations Plus. Learn all about Windows, Doors, Roofing, Electrical, Plumbing, Decorating, Blinds, Upgrades, Bathrooms and Shower Doors.